W wanted something warm tonight, so I came up with a French Lentil Chili. Lentils are low in fat and high in protein and fiber. The good news is, they cook quickly. Lentils have a mild and earthy flavor, and are best cooked with strong flavorings. French green lentils are sort of peppery and hold their shape rather well. They don't get mushy like most other lentils. Always rinse lentils and pick out stones and other debris. There's no need to soak them. Store lentils in a cool, dry place. Cut carrots, onions,tomato,celery, and peppers into 1 large chunks. Toss in a bowl with 2 tablespoons of oil and a dash of salt and pepper. browned, stirring and turning during the roasting. Let them cool and then chop them into smaller course chunks.. 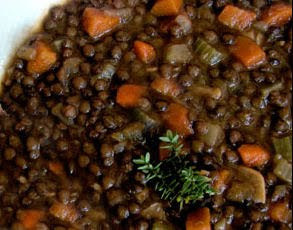 Combine washed green lentils in a large soup pot with 4 cups water and 1 teaspoon of salt. Bring to a boil, and simmer, covered, for 25 minutes, or until the lentils are tender but still firm. Drain the lentils. Add the chopped roasted vegetables, vegetable broth, and other ingredients to the lentils. Simmer for about 30 minutes and adjust the seasoning as needed. Remove the stew from heat and stir in 2 tablespoons olive oil, and serve over spiralized zucchini or rice. Garnish with parsley or rosemary and slivers of avocado slices.